Love your Tristan clothes? 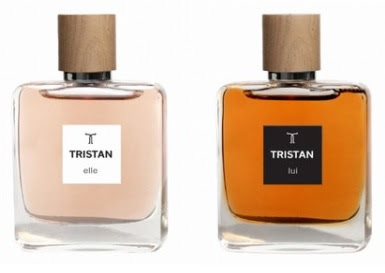 Now love your Tristan scents with their very first fragrances for both men and women! Tristan elle - 50ml EDP - $55 - an elegant floral fragrance with modern twist with top notes of pink berries, lemon and pepper; heart notes are a multi-coloured mix of delicate and precious jasmine and magnolia; and base notes of white wood, musk an patchouli. Tristan lui - 50ml EDP - $55 - was inspired by the opulence of high quality fabrics, leather and wood with a musky bouquet of cardamon, saffron and incense with a leather base note mixed with musk. And while the women's is a little too floral to be to my taste, the men's is really nice - I'm not a big fan of male fragrances that smell so metro that women would be comfortable wearing them too - I like my men (yes, that's plural, I have a whole string of them) to smell manly, like they could pick me up and carry me out of a burning building or other such manly pursuits and the Tristan lui has me practically feeling the heat! Available at Tristan stores across Canada and online at www.tristanstyle.com.